Right-wing groups have been waging war against public sector unions for many years, and, last week, a divided 5–4 conservative majority on the U.S. Supreme Court handed them a win in Janus v. AFSCME Council 31. This case, which overrules decades of precedent, was about stripping unions of resources, with the ultimate aim of eradicating labor unions altogether. Why was this such a prized goal for these right-wing groups? Because unions help level the imbalance between the rich and powerful and everyone else, and help working people get ahead. Janus’ supporters argued that the “fair share” fees nonmembers pay for union representation violate their First Amendment rights, even though workers have the right not to join a union or pay for any of the union’s political work. Justice Elena Kagan dismissed the majority’s opinion as “weaponizing the First Amendment,” noting that the same argument was raised — and unanimously rejected — 41 years ago in Abood v. Detroit Board of Education, a precedent the Supreme Court has upheld six times. With this reversal, public employees who benefit from a collective bargaining agreement but choose not to join the union can opt to be “free riders” and not contribute anything for the benefits they receive, while the union must still represent them. While right-wing groups are mobilizing and spending many millions of dollars to “defund and defang” unions by attempting to pick off our members, people are sticking with the union. The misleadingly named Freedom Foundation contacted the 34,000 members of United Teachers Los Angeles, urging them to drop their memberships. Exactly one person did. Union leaders across the country have told me that they got calls after the Janus decision — not from people who wanted to drop, but from those who wanted to join or recommit. Linda Greenhouse, the Pulitzer Prize-winning, longtime Supreme Court observer, recently wrote that the court’s “attack on public employee unions has little to do with the Constitution and a whole lot to do with politics.” Indeed, the right wing of the Supreme Court is going well beyond its charge to interpret the Constitution. With the reliably conservative vote of the newest justice, Neil Gorsuch, the Supreme Court is transforming from an impartial protector of constitutional liberties and minority rights to an activist, partisan champion of the powerful and the political right — which is exactly how a web of right-wing, dark-money groups planned it. Gorsuch ascended to the high court after Senate Republicans stonewalled President Barack Obama’s nominee, Merrick Garland, for 293 days, riding out the clock until Donald Trump took office. The conservative Judicial Crisis Network alone spent millions to pressure the Senate to oppose Garland’s confirmation and then to support Gorsuch. JCN’s primary funder is the Wellspring Committee, a right-wing group based in Virginia that also supported Illinois Policy Action, a conservative organization that represented the plaintiff in Janus v. AFSCME — in which Gorsuch just cast the decisive vote. Janus poses a challenge for public sector unions, one we have been preparing for. But it presents great opportunities as well, as unions have re-engaged with our members. 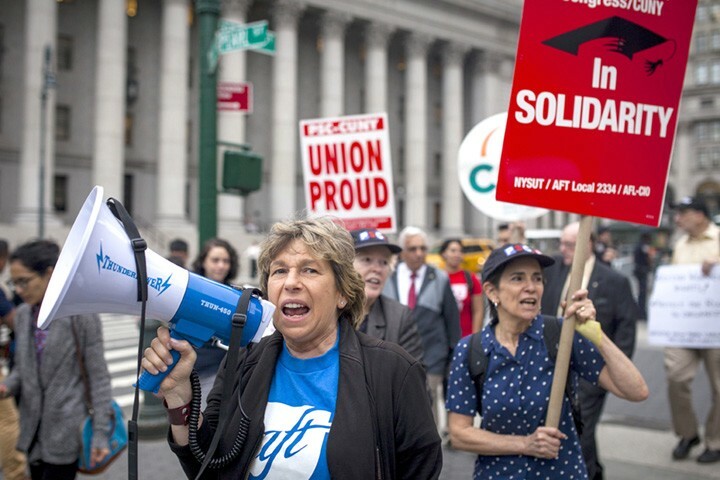 The day of the Janus decision, AFT nurses in Ohio won a contract that created safe staffing levels, and 2,400 faculty in Oregon voted to join the AFT. Union members will continue to care, fight, show up and vote — to achieve together what individuals cannot do alone. Don’t count us out. American Federation of Teachers president, committed to improving schools, hospitals and public institutions for children, families and communities.